Not a week goes by that we haven’t had cold temperatures, rain, and hail. It’s light at 9 o’clock at night, yet there is snow on the mountains (LOTS OF IT)! The good news is, my spring plants are loving life. The bad news is–do I dare plant tomatoes? The ugly truth is: I didn’t start my plants from seeds this year. I was just too busy with everything, and thought “I’ll just buy them–it’s nearly as inexpensive as seeds.” Boy, was I wrong. To get a nice sized tomato plant is $5 EACH!!! Smaller plants are $3, and you can buy a 4-pack of TINY tomatoes for $1.65. I went with the tiny. Check out my peas! When they were half this size I fertilized with 9-59-8 and they shot right up. I’m going to fertilize again soon! This is the same garden from the side, so you can see the other plants. I realized that I should have given my peas a little more room–the parsley is a bit crowded next to them. But my big, beautiful broccoli is doing great. The plant seems disproportionately large compared to the head (only 1″). I fertilized these with 21-0-0 about two weeks ago, and I can tell it really helped. I’m going to fertilize again now, and then right after I harvest the heads (to promote side-shoot growth). From right to left are onions, more broccoli, and more onions. 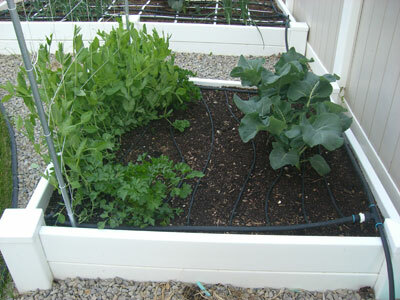 On the very left you might see a cherry tomato plant. 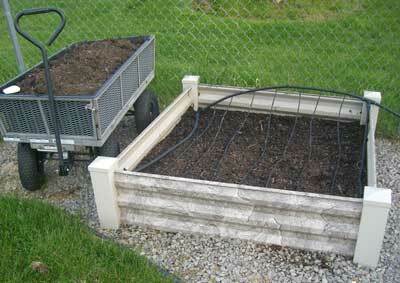 I have also planted beets, swiss chard, and cucumbers (but they’re too small to see). This is where I planted my potatoes–I am waiting for them to sprout above the soil so I can add more soil, and hopefully increase my yield of potatoes. 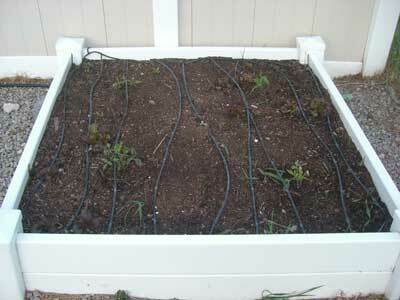 In the corners are spinach, and then I planted three tomato plants. The one on the top left is so small you can’t really see it. I may have to break down and buy bigger ones. ARGH. 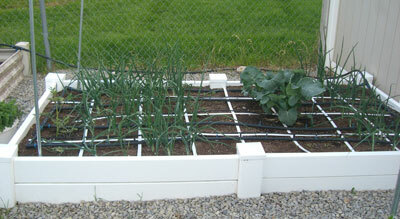 This garden bed always gets too much water (still trying to figure that one out! 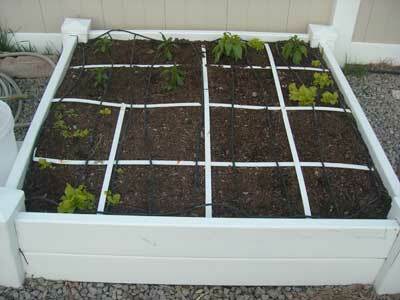 ), so I decided to grow my peppers here. 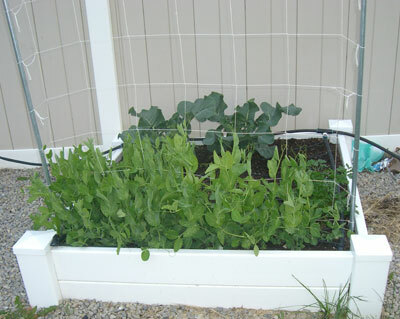 I’ve already got some small leaf lettuce growing, and I added Big Jim, Anaheim, and Cayenne peppers. I just bought some Bell and Jalapeno that I need to plant. And finally four more tomatoes. Doesn’t this box look sad and scraggly without the grids? I’m going to invest in or invent more! Some days I wish I had wood, so I could just use string! So that’s my garden update. If it would ever get warm I know things would grow. But honestly, I think of the people suffering from flooding, the farmers who will have no crops to sell, families without homes, and I realize how small my concerns are. But experiencing the frustration of the elements helps me relate, if just a little, to those who are impacted by the earth and the weather. 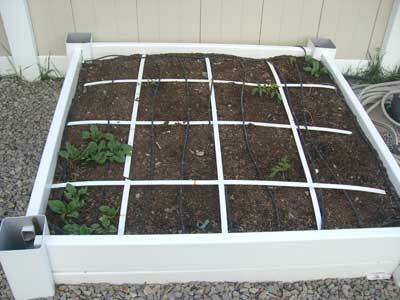 I’ve seen others stretch masking tape across their raised beds to mark off the sections as a temporary solution. You might try that until you can find or purchase a more permanent solution. John–it’s hard to say. One thing I’ve heard about these very tender plants is that cold temps can stunt them–they won’t die, they just won’t do much. So I might pull half of them and start over, leave the other half. Then report back to me how it goes! Still winter in northern Nevada too! I got antsy and planted transplants over the Memorial Day weekend and a few days later it got down into the high 30’s for one night. My eggplants look terrible! Almost all of the leaves are totally wilted but there are some small leaf buds off of the stalk. Should I pull them out and start over or just wait for them to recover? The peppers looked bad too but seem to have recovered somewhat. I’ve been away for a week, so we’ll see how things are when I return! 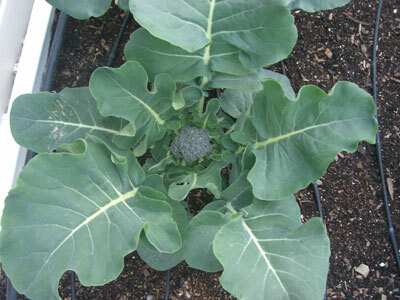 I harvest the broccoli when it’s not that large–maybe 4-5″ in diameter. Growing your own, I find it’s a little smaller than grocery store broccoli. But don’t forget to cut the head with 4-6″ of stalk (which is soft and delicious) and then fertilize to encourage side shoots. They will be smaller, but just as delicious. I wouldn’t worry about your tiny tomatoes… I’m not far from you and mine have been tiny until this week–the warm weather finally hit and they have quadrupled in size and have blossoms already. I was quite surprised. It also seems the bees are out in force. The #1 question I’ve been getting is protecting plants from critters. I’m working on an article! Joyce–the feedback I get over and over is that year 2 or 3, the Mel’s mix doesn’t always produce as well. I think part of the problem is the difficulty finding enough various types of compost (5 kinds) to provide a variety of nutrients. Either way, I suggest using organic amendments (like egg shells, epsom salt, etc.) and/or chemical fertilizer. I thought that if we added the correct Square-Foot Gardening blend (1/3 peat moss, 1/3 vermeculite, and 1/3 mixed compost) we would not have to fertilize all season. I did not fertilize last summer and my tomaotes and peppers did very well. Your gardens look great! Our were destroyed by a hungry groundhog. He ripped down our tall peas and beans, ate every leaf, and then polished off our herbs. Any idea what we can do next year to avoid having all of our hard work ruined again? Over on the other side of the country in the northwest we just got through the sixth coldest May on record, with us hitting 70 only once and at the latest I can remember so I didn’t transplant my tomatoes out until June, which meant that they had to stay cramped in the grow box for an additional month. So hopfully late spring is around the corner. Could you use small screw eyes in the vinyl and use string for grids? You could probably seal it with some caulk if you were worried about water getting inside the vinyl.